HOWTO: Dual Spec – Welcome to Spinksville! I hopped onto the Euro PTR yesterday to check out the current state of dual specs for myself. I’m impressed. It’s easy to set up, easy to switch, and easy to understand. Note: I promise this is the last dual spec post until the patch hits. And the trainer now has an extra option, if you want to learn about dual talent specialization. You’ll also notice that he doesn’t think a warrior’s role is to hit stuff hard with 2 handed weapons. Not much of a trainer, now that I come to think of it. So you talk to him/her about dual specs and this is what you are told. And finally at the bottom is where you get to spend your 1000g for a shiny new tab on your talent screen. So you spend your money and then go check your talents. You’ll see a second tab has appeared on the right hand side. Near the top of the window some text now reads “These are your active talents.” In any case, I have the top one selected at the moment and can respec that as per usual. I can also slot in glyphs and arrange my hotbars just as I would normally. I can also select the bottom tab and assign points for my secondary spec. BUT until that spec is set as being active, I can’t organise glyphs and hotbars for it yet. 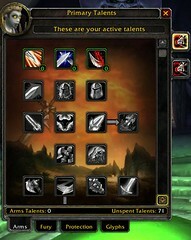 So to set up the hotbars, click on the second tab and then on the ‘Activate these talents’ button which will appear at the top of the talent screen when you’re looking at the set that are not currently in use. Last step: both sets of talents are now assigned. You can see that the icons on the right-hand tabs have neatly now changed to show which tree I’m most heavily specced in for each talent set. (Fury and Protection for me, I assume most people can recognise their own talent tree icons). In this screenshot, I have just finished sorting out my hotbars for Fury and I want to switch back to Protection. 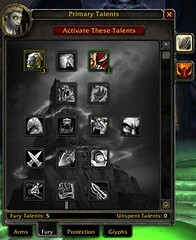 So I look at my talent screen, select the Protection tab, and then hit the red “Activate these talents” button. And 5s later, I’m specced, glyphed, and hotkeyed for Protection again. There is also a new wardrobe type function that lets you save gearsets. This is activated from a new button on your paperdoll screen (ie. the one that shows your character and the gear it is wearing). I wasn’t so impressed with this so didn’t take screenies. It lets you ‘save’ sets of gear that you are wearing (so first wear the set you want to save, then use the new wardrobe to save it under whatever name and icon you want to choose) and then retrieve them by clicking an icon. There’s no extra storage, the gear is still in your bag. I found it a bit clunky to use and I think I prefer other addons to for gear switching and don’t plan to use the baked in one. It also isn’t synched to spec swapping in any way that I can see. This entry was posted in warcraft and tagged 3.1, baked in, how to switch talents, public test server, screenshots, using dual specs, wardrobe. Bookmark the permalink. ← Pragmatists vs … Achievement Junkies? It makes sense that Blizzard would try to incorporate an item-rack like function with Dual Specs. I am sure many druids will be disappointed at the lack of item storage ala Diablo. 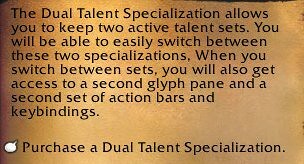 Just one bit of clarification – It seems from what you are saying, when you buy dual spec it resets your talent points. Is that correct? 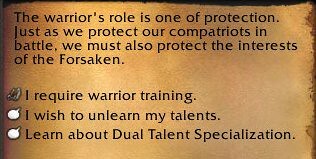 When I tried it on the PTR, it did reset all my talent points. Yup. Not a “free respec” per say, but probably good for those who plan to use the opportunity to create two different specs than the ones currently being used. Interesting choice. Pingback: Fury for Beginners « Welcome to Spinksville! Pingback: Protection for Beginners « Welcome to Spinksville!